Teadora invites you to drench yourself in sensory beauty with their Rainforest at Dusk Nourishing Lip Butter. "Packed with antioxidant rich Buriti, Brazil Nut, Andoriba, Maracuja (Passion Fruit), Acai, oils. Capucau, Murumuru, Mango Butters plus Carnuba Wax, our Rainforest at Dusk Nourishing Lip Butter comes in a delicious chocolate-berry flavor we call Acai - Acu and provides light exfoliation and intense hydration for your lips." 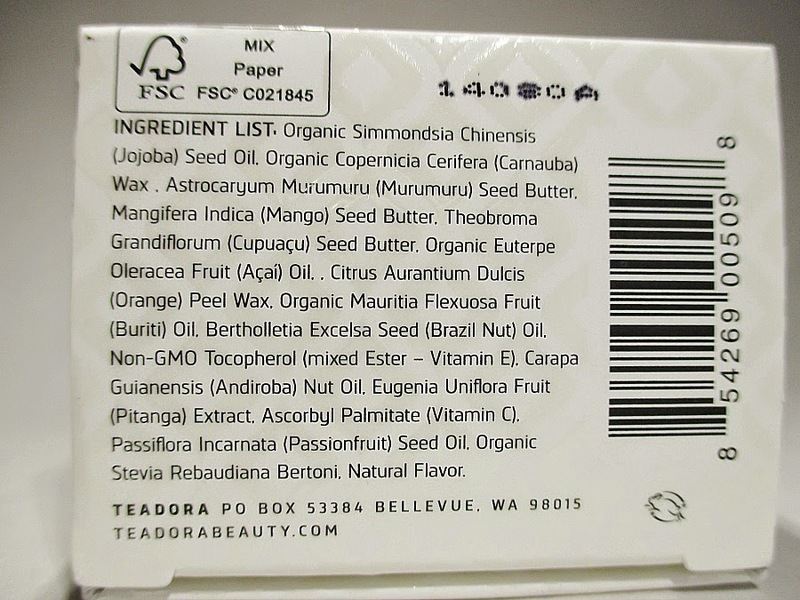 Teadora Rainforest at Dusk Nourishing Lip Butter Ingredients list. All of the ingredients are natural, many sourced directly from the Brazilian rainforests. 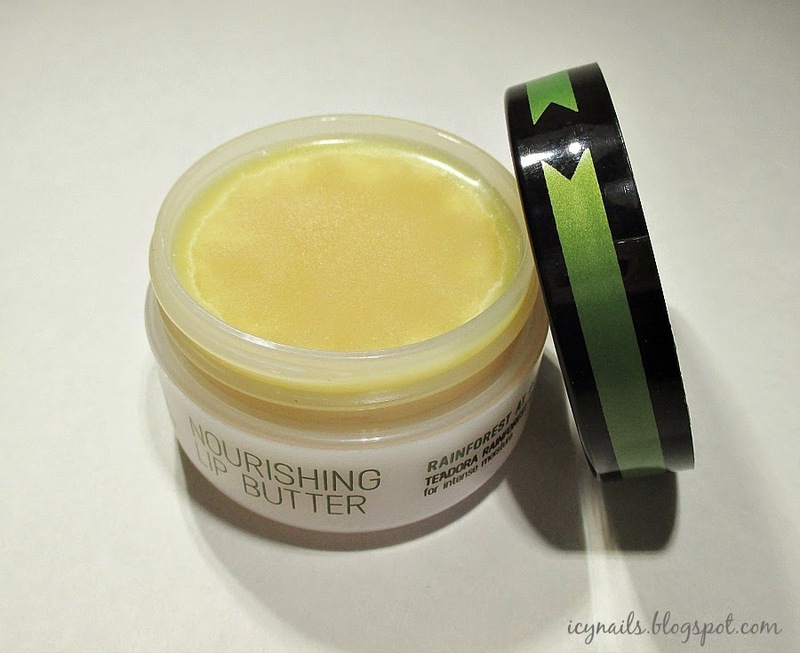 This lip butter is cruelty free and vegan. This lip butter is chemical sunscreen free. 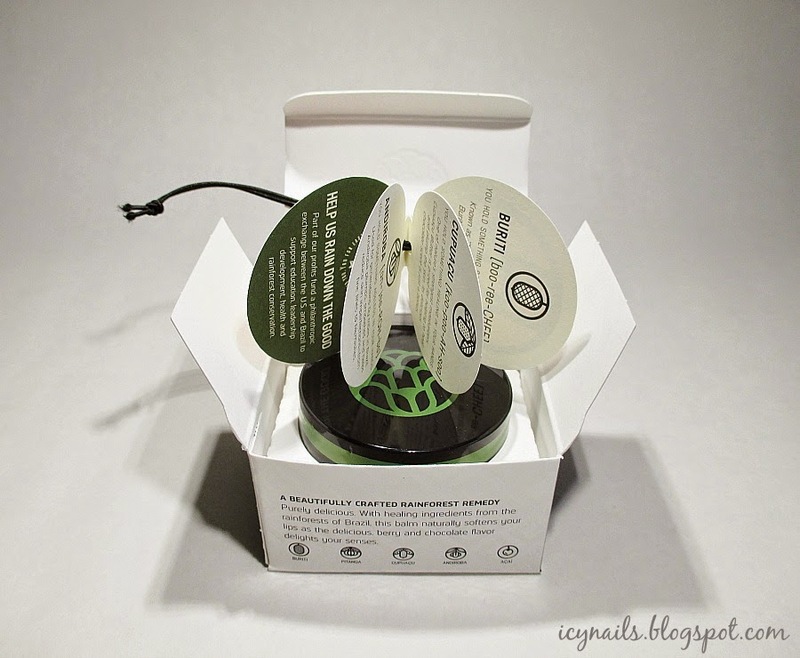 I encourage you to click the link provided and read all about Teadora's commitment to using only the finest natural ingredients, and their mission statement to provide beautiful products and their commitment to preserve the rainforests. Opening the box is a treat. First of all, every exterior surface is a font of useful information about the product you are about to experience. Do you remember the old Celestial Seasonings herbal tea boxes? Sitting and sipping their tea and spending how long? Exploring that box and discovering delicious tidbits and words of wisdom on the top, sides, bottom and flaps. This packaging is like that! And I was delighted. Once I got it open, the fun didn't end. As I opened the flap, there was a tiny, round flip book on top of the jar full of information on the key ingredients in this lip butter and a little bit of information on Teadora's philanthropy and their commitment to "Rain Down the Good." Pluck the jar from it's secure box nest and open the lid to a warm, golden cake of softly cocoa and berry scented lip butter. The lip butter is fairly hard, you can get it out of the jar in a couple of different ways, depending on how you would like to use it. 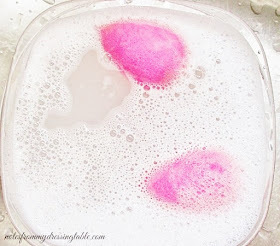 To lightly exfoliate as you moisturize, scrape up a little of the product with the front of your fingernail then apply and lightly but firmly rub the product in, letting the naturally grainy quality of the butters and wax gently buff away uneven texture and dry skin cells then enjoy the nourishing, softening properties of the oils and butters softening your lips. You can also apply as I prefer to do. Set a clean finger pad directly down on the surface of the lip butter and allow the warmth of your skin to melt the product then swirl up the liquefied goodness, apply and allow the oils and butters to soften and pamper your pout. However you apply this lip butter, the beautiful, natural ingredients will make your lips feel wonderfully soft, smooth and cared for. The delicious chocolate berry scent and the lightly naturally sweet taste will keep you coming back for more and more. Teadora Rainforest at Dusk Nourishing Lip Butter is packaged in a generous, half ounce jar and is $15.00. This is a good value, as this lip butter will last and delight you for a long time. 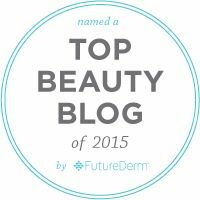 While you are perusing the Teadora Website for your Lip Butter, don't forget to check out their other beautiful products for body, hair and skin. Like Teadora on Facebook, follow them on Twitter and hang out with them on Instagram and Pinterest to keep up with the latest news you can use on their products. 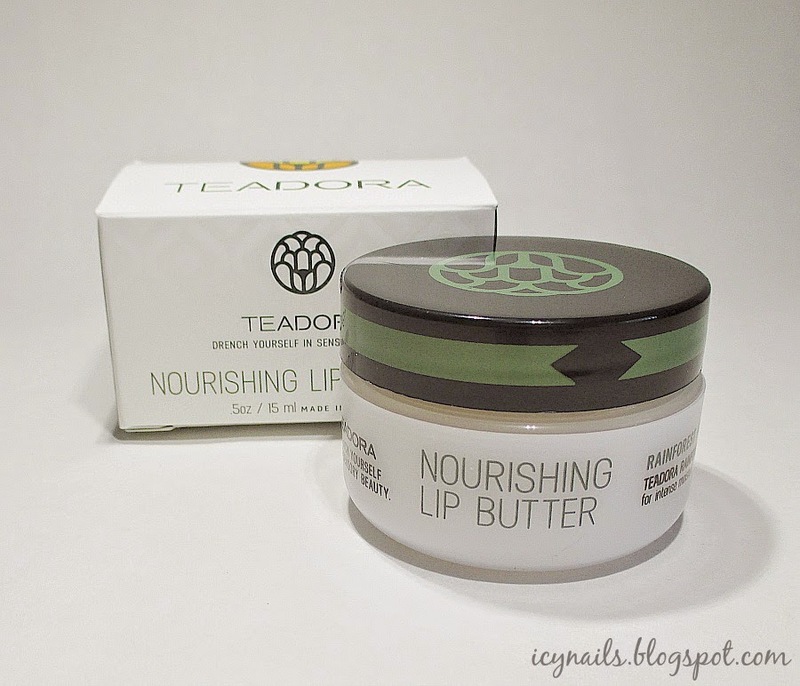 Have you tried Teadora Rainforest at Dusk Nourishing Lip Butter? Or any of Teadora's other products? What do you think? Please do tell. Thank you for swinging by and reading and have a beautiful day! I love the scent & taste of the orange. Glad to hear that the chocolate berry is good too! Sounds like a great lip butter. I've been using the other fragrance at night and love the results! Sounds like a wonderful lip butter. Great for wintery dry lips. I'm sold on this product ! This sounds so nice! I really want to give it a try. I'm glad I got the Dawn version, but I think I want this one, too! It's a great lip scrub. Hm I've heard so many good things about this! I have the other flavor and like it as well! I keep reading great reviews on this, cannot wait to try it. I have read so many reviews lately. I need to get my hands on it. I had a hard time deciding. I'm a fan of both flavor profiles. I think I'm going to use this a lot, as it gets colder and drier. The humidity can get below 0, here sometimes. Crackling dry! It really is. I'm glad that I got the chance to test this one. This one is so yummy! I really need to try this out! I'm in love with the orange one, but this one sounds lovely too! I had to think hard about which one to choose, as I love orange, too. This one is lovely. You should. I think you'd love it. Yes, it is. I am enjoying it.